I’m going for it. Black tie function: no Tatum, no hat. Just me, my crew cut, and a certain amount of bravado. None of my elegant evening outfits is improved with a straw fedora or sweltering helmet hair. So I’m hoping these fierce stems will draw attention away from my teeny head and toward my fabulous feet. 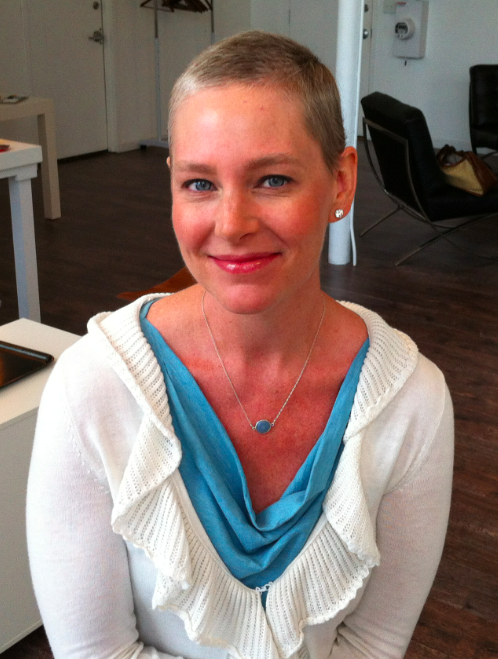 In a flattering light, maybe this super short ‘do has evolved from chemotherapeutic to… French? Je ne sais pas. It’s entirely possible that this surgically altered body balancing atop platform heels looks like the-drag-queen-lost-his-wig. Trusted girlfriends are vital to these doubting moments in front of the mirror. Happily, darling Linda has arranged for A Day of Beauty. She will be here soon to deliver me and my sad, drugstore makeup collection into the expert hands of women who paid better attention to their pretty mothers at their toilette. For 25 years I’ve been going out into the world in little more than waterproof mascara and an embarrassment of pink eye shadows. If the event is sufficiently fancy, I’ll still draw blue half moons under my eyes as if everybody plans to Wang Chung tonight. Even if I don’t pick up any new skills today, the helpful staff at Serra will probably insist that I un-learn a few. I haven’t submitted to expert makeup application since my Chinese Wedding Banquet. Eleven years ago, A-Ma ushered me to the Shiseido store in Flushing, NY, where the only-Mandarin-speaking staff offered me a tray of neon eye shadows and asked me to “pick color!” Eventually they sort of gave up trying to work against my unfamiliar complexion: “Waaah, SO pink!” I think today may go a little differently. Even as a veritable cosmetic rube, I’m actually pretty excited to surrender myself to whatever plucking and powdering they deem necessary. Also this forced mirror-gazing time will be a sort of immersion therapy to get accustomed to baring my un-hatted head in public, and summon my inner Twiggy. Generous Gretje, a talented photographer, recently extended a lovely invitation to memorialize my shorn self in digital splendor for posterity. Although some women are empowered embracing their hairlessness, and bald-is-beautiful, and beauty is on the inside, and blah blah blah, these women (with their better-shaped heads) are less vain than I. I’m not camera ready. I still startle at the sight of that fuzzy girl in the mirror and am loathe to dredge up the feelings I associate with having no hair: fear, cold, loss. Thankfully, and possibly with the help of too much wine, these memories have already begun to fade. Tonight is the last graduation dinner of the season, so off we will go to the country club for the final steak-or-fish dinner. There are certainly more unfortunate fashion disasters than really really short hair, but I’m feeling very “…into the fray!” regarding my Tatum-less debut. Somehow Linda knew I’d need the confidence-bolstering effects of looking pretty: a feeling that essentially vanished with my hair. But even without pricy cosmetics, Linda’s unwavering support, her passionate embrace of life, her effortless navigation of the universe toward lovely things, and her spiritual handholding as my Zen role model for trust in God (Beauty, Love, Light) prove that some things cannot be lost. Today Beauty is found not in the mirror, but in a trusted girlfriend… who also happens to be a knock out. Thank you, gorgeous Linda.